Richard Attenborough | Cappa Toons! Well, now I can check off another great classic on my list of must see films. The Great Escape is a pretty tremendous film, with three great stars in the lead roles: Steve McQueen, James Garner, and Richard Attenborough. I liked the epic feel of this story. It’s a true story by the way, where supposedly every detail of the Escape is exactly as it happened. I have to admit, when watching the film, the escape itself is an incredible undertaking as these POW men band together to dig an escape tunnel under the fence and out of the compound. In a funny way, I saw the whole thing play out as sort of a game. It’s the escape game if you will, and sometimes it’s funny to watch as the men have to come up with ways to make noise and distract the Nazi’s from the real noise their making in trying to dig through the tunnels. There are secret codes and messages, giving the men enough warning when Nazi’s are coming while they’re in the middle of planning and executing their escape. Then of course there’s Steve McQueen whose character becomes almost a running gag for all the time he has to spend in “The Cooler”, a solitary confinement room where he has nothing to do but chuck a baseball against the wall. I also really enjoyed watching Richard Attenborough in this film. Like most people of my generation, I know him best as Hammond from Jurassic Park, but it was great to finally see his earlier work and see what an incredible actor he was. Already his clock is ticking and this major escape attempt is a risk to his life as the Nazi Commandant tells him if he tries to escape one more time he’ll be executed. Of course, if he’s going to go out escaping, he’s going out with a bang, as it becomes his mission to get all 204 men out of the prison at the same time. Attenborough gives a kind of understated performance, and a seriousness that seems to keep him driven to make sure everything goes to plan as leader of the escape. The film plays out in three acts, each lasting almost an hour, with the first act introducing and setting up the plan for the escape. The second act focuses on the execution and work the men put through to keep the Nazi’s unaware of their plans, leading up to the actual escape. The third act focus on the 74 men that do get out as they attempt to flee Germany for Switzerland. The final hour of the film is certainly engaging, although so many men end up getting caught, I was starting to wonder if anyone was going to actually get away at the end. The part that confused me the most was the reasoning behind why Steve McQueen’s motorcycle hopping the fence was supposed to be such a famous scene. When the scene was coming, I expected something far more dramatic and epic than what we got. It turns out the motorcycle hop is filmed at a long shot, with McQueen hopping a four foot fence. It’s an impressive trick, I guess, considering that McQueen did the stunt on his own. But there’s no drama to it, no swelling music…it’s just…a motorcycle hop. So why are people so blown away as to make this a famous scene in the film? I’m not sure. Maybe it’s just that it was more impressive for its time than the kind of stunt work I’m accustomed to seeing in movies today. But this just felt like a letdown because the stunt was fairly understated and didn’t seem like that big a deal. Some of the other things I liked about the film was that it kept a fairly light sense of humor, although I am not sure how different the POW camps were from the concentration camps, and why the Nazi’s seemed to think the POW’s deserved better treatment (apart from religious persecution/ discrimination). The prisoners are free to walk around the camp, garden, play sports, and surprisingly McQueen is allowed his baseball and mitt in the Cooler when I think that would defeat the purpose of solitary confinement for the Nazis. Who knows. I think some of the freedoms the prisoners had might have been played to give the film a lighter, not too serious tone. After all, the movie plays itself with a sense of fun, and the excitement of the audience being in on the major escape. Although, I think the darker third act makes up for the lighter beginning as we see some of the prisoners who aren’t so lucky. 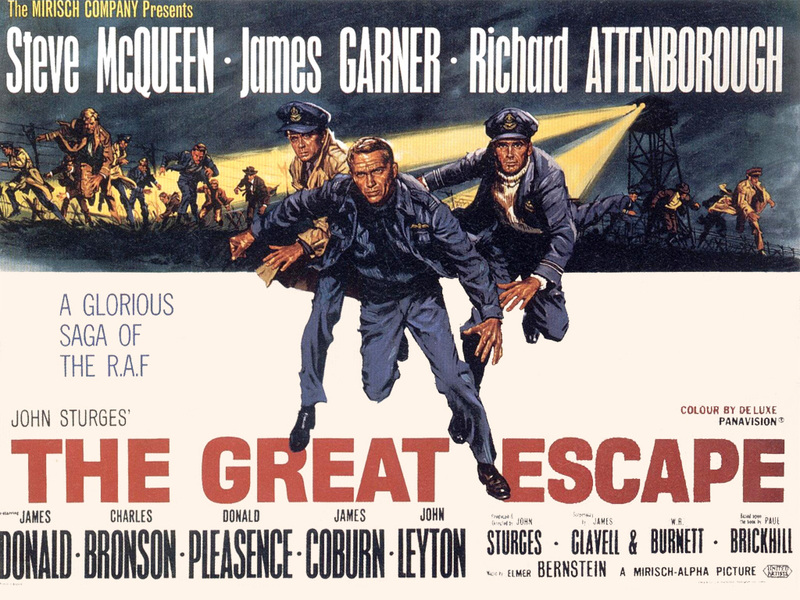 Overall, I really liked The Great Escape. I don’t think it’s a truly great movie, mainly because it plays up some romanticism/ “escapism” of the audience wanting to be part of the adventure in this prison escape movie. The lightness the film portrays is obviously opposed to the much more serious things that were happening in Germany at the time. But hey, it’s a movie. I can enjoy the film for what it is, and if anything it’s enjoyable, well-acted, and a good time for all.